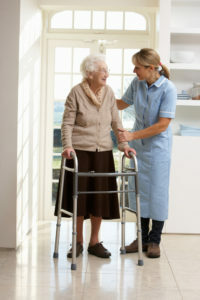 Whether your family member is dealing with the normal challenges of aging or coping with the effects of a recent surgery or a chronic disease such as Alzheimer’s or dementia, you’ll find comfort in knowing a highly skilled nurse from our Registered Nurse home care staff is overseeing their care and treatment plan. With over 13 years’ experience caring for elderly and disabled residents throughout the North County communities of San Diego, our team of Registered Nurses is especially sensitive to the nursing care needs of our clients. Experienced In Home Care has trusted and reliable RN Home Care providers with a reputation for providing our clients with affordable home care administered by qualified Registered Nurses. Our Registered Nurse home care staff are experienced medical professionals who specialize in providing high-level nursing services within an in home care setting. In addition to providing basic and high-level medical care, our RNs oversee and ensure the safety and efficacy of each of our client’s treatment and care plans. As an experienced provider of quality in home care services, we ensure our clients’ care by employing some of the best home nursing care providers in the industry. Each of our Registered Nurses has received two or more years of specialized medical education and carry the required nursing licenses to practice in the state of California. The services they provide to our clients are performed under the direction of a licensed physician. All of our Registered Nurse home care providers are CPR certified, bonded, and insured, and each has had a professional screening and criminal background check conducted. Our Registered Nurse home care services are available 24 hours a day, 7 days a week, including holidays and weekends. We accommodate a variety of routine nursing care schedules, including flexible Registered Nurse home care visits by the day, week, or month, and routine hourly care (2-hour minimum service). As a trusted provider of quality Registered Nurse home care services, we are committed to helping our clients maintain their sense of dignity and independence while providing the assistance they need to live a safe and comfortable life at home.